Bengalis and their love for fish needs no introduction. If you happen to be a Bengali or have a Bengali friend or a relative, you would know that fish is not just a delicious addition to our plates but an integral part of many of our rituals and celebrations too. From the ‘annaprashna’ first rice eating ceremony of a baby to weddings and even the funeral rituals – fish plays an intrinsic part. The season of weddings is here, and needless to say families of Bengali brides and grooms are getting ready for the many wedding rituals where the fish plays an important role. Here’s a lowdown on all of them. ‘Aiburo bhaat’ a final feast arranged by the families of both the bride and the groom just a day before they tie the knot. ‘Aiburo’ means an unmarried young adult male or female and ‘bhat’ means rice – it is the final feast that the young bride or bridegroom is served right before they get married. Parents and families, in order to pamper their children, try to arrange the best feast including Bengali delicacies like channa dal, shukto, luchhi/Puri, kosha mangsho, mango or tomato chutney, aloo posto, payesh, roshogolla and many more. One inevitable part of the this rich culinary affair has to be the delicious fish preparations: from maacher jhol to doi maach, all fish preparations are carefully selected and cooked for a feast which the soon-to-be-married are not going forget in a hurry. 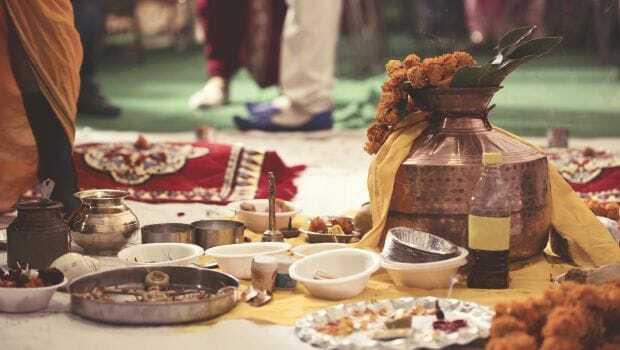 On the day of wedding, the bride and groom prepare for their respective Gaye Holud ceremonies. In this ceremonies both the families of bride and the groom smear turmeric paste on the bodies of the bride and groom. For the bride’s gaye holud, the groom’s family – except the groom himself – travel to the bride’s home. They have with them bride’s wedding outfit which she’ll don for the wedding, the turmeric paste which the bride would be using for her ceremony, some sweets and gifts. In addition to this they also take a large Rohu fish, which is decked up as a bride, draped in a sari, and decorated with jewelry, sindoor, paan and some turmeric. This ritual is called Tattva. Fish symbolises good luck and prosperity, the gesture of groom’s family gifting the bride is their way of extending their wishes for her happiness as she embarks upon this new journey. Bengali Wedding with Fish dressed as bride and groom! During the time when gifts and sweetmeats are being exchanged between the bride and groom’s families, the motif of fish plays an integral part. The wedding sari of the bride is wrapped in a way that it resembles a fish. 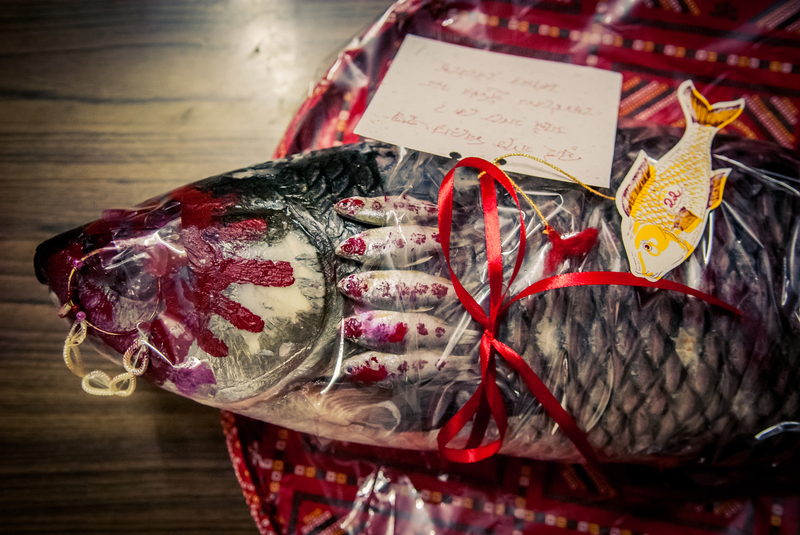 Similarly, sweets are also decorated in the form of fish when they are sent as gifts to either household. One of the first ritual as the bride takes her first steps in her new household is showing her a decorated fish. Fish holds immense significance in a Bengali household, looking at the fish is said to mark her auspicious start in the new household. The wedding season is upon us. Indian weddings especially are a mélange of many varied traditions, rituals and celebrations. While we make merry in the celebratory vibe, it is never a bad idea to dig deeper and unearth the significance of the rituals that have stood the test of time and stayed with us. Fish and its role with Bengali wedding rituals is one such association. Next article What goes into the making of a Sabya bride?